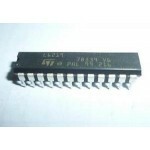 Purchase online DRV8825 Stepper Motor Driver in India at low cost from DNA Technology. Want to controller stepper Motor from Arduino, Raspberry Pi or any other Micro-controller? Well then this stepper motor driver will simplify your coding and will give you more flexibility in controlling the stepper motor. Note: Not all stepper motors can be controlled by DRV8825 Stepper Driver. The DRV8825 stepper motor driver carrier is a breakout board for TI’s DRV8825 micro-stepping bipolar stepper motor driver. The DRV8825 features adjustable current limiting, over-current and over-temperature protection, and six microstep resolutions (down to 1/32-step). It operates from 8.2 – 45 V and can deliver up to approximately 1.5 A per phase without a heat sink or forced air flow (rated for up to 2.2 A per coil with sufficient additional cooling). This product is a carrier board or breakout board for TI’s DRV8825 stepper motor driver; we therefore recommend careful reading of the DRV8825 datasheet before using this product. This stepper motor driver lets you control one bipolar stepper motor at up to 2.2 A output current per coil. 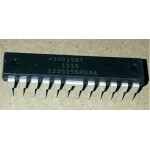 A4988 Stepper Motor DriverDMOS Microstepping Driver with Translator and Overcurrent ProtectionThis i..
A3967 EasyDriver Stepper Motor DriverThe EasyDriver is a simple to use bipolar stepper motor dr..
L6219 Stepper Driver ICThe E-L6219 is a Bipolar Monolithic Integrated Circuit/Stepper Motor Driver, ..
HG7881 - L9110S ModuleThe L9110S 2-Channel motor driver module is a compact board that can be used t..
A3992 Full-Bridge Motor Driver DMOS Dual Full-Bridge Microstepping PWM Motor DriverDesigned for pul..